What’s appealing about most work from home opportunities (setting your hours, lack of office politics, working in PJs) can also be total motivation zappers. The lure of the couch, binge-watching TV series on Netflix or an afternoon trip to Barnes & Noble can sometimes seem infinitely more appealing than just about anything having to do with work. No matter your work ethic, you’re bound to feel unmotivated while working from home. It happens to the best of us. But don’t worry, there are some practical methods to help get (and keep) yourself motivated. Below you’ll find five work from home motivation tips to give you a little get-up-and-go. Thanks to the popularity of The Odd Couple which introduced us to the disheveled, slovenly, sportswriter, Oscar Madison, work from home pros sometimes get a bad rap where hygiene and cleanliness are concerned. This might be true, for some, but certainly not all (or at least not all the time!). Full disclosure, there are definitely some days I wake up, roll out of bed, grab a coffee and answer emails, make phone calls and write well into the afternoon without much consideration into the fact that I’m wearing day-old clothes and greasy hair. I mean, who is there to impress in that regard, my cat, Lenny? He’s seen me at my best and worst. And frankly, he doesn’t much care what I look like as long as I keep his food dish topped off and offer a lap to sit on. And when you’re working from home, there will be those days when you feel pretty good about the fact that you even managed to get a pair of clean-ish yoga pants on. And if you’re getting work done and staying ahead of deadlines, more power to you! But then there’s those days when you’re feeling less than ready to tackle the simplest of to-do list items. And that’s when your sweats and tangled hair can really be working against you. Thankfully, a shower and clean change of clothes can make a world of difference. There’s something about the process of rinsing away the previous day and a fresh set of clothes that can really refresh your entire perspective and put a little spring in your step. As a bonus, you might find that a shower provides you with a little inspiration as well as motivation. Getting things done can, well, motivate you to get more done. If you’re a freelancer, you probably already use a weekly or monthly calendar to help you keep track of looming deadlines. This is a great practice that you should use to help you keep motivated throughout any given workday. Invest in a small dry-erase board, you can pick one up at Amazon for around five bucks, and each morning (or if you’re a night owl, afternoon) write out each of the things you need to do that day, no matter how small. As you complete even seemingly insignificant tasks, cross them off your list. Why? The idea is that accomplishments, even the smallest ones, are motivators. That’s right. If you get something done, you’re likely to get more done. Something about checking an item off of your to-do list really gives you a sense of satisfaction and achievement. And you’ll want to replicate that same sense of satisfaction by getting more done. By the end of the day you’ll have a whiteboard with a long list of completed tasks and a sense of accomplishment that you can parlay into tackling the next workday. Easier said than done, right? Not exactly. Science tells us that motivation is really a psychological thing. Changing the way you think about the things you need to get done can make them easier to do. When you’re feeling unmotivated, you’re likely looking at a task or a list of tasks and saying, ugh, I have to do this. By telling yourself you have to do something, you’re psyching yourself out. Instead, opt for the more motivational-friendly “I choose to.” As in, I choose to write this 1500-word article about the intricacies of the catalytic converter. When you feel like you’re in charge, you’ll be more compelled to complete a task. Remember, when it comes to work, there’s not a whole lot you really have to do. You choose to do these things because you like to earn an income, have a roof over your head, food in the kitchen, and an Amazon Prime membership. The next time you feel like you don’t want to do something, remember you choose to do it. Scientists have found that your motivation really flourishes when you stay true to your values and beliefs. So, if you find yourself constantly demotivated when it comes to completing your work, perhaps it’s time to reflect on why you started doing the work to begin with. As far as work from home motivation tips goes, this one often resonates. A work from home life is not always easy, but if you can think back to why you opted to get into whatever work from home field you chose (writing, virtual assisting, customer service, etc.) then perhaps it can reinvigorate you, too. Did you start freelancing as a graphic designer to spend more time with your family or opted to become a virtual assistant to achieve a better work-life balance? Whatever spurred you to work from home to begin with, can also motivate you to get work done. When thinking of work from home motivation tips, this is one of my gold-star standards. Even as I write this article, I’ve got my headphones plugged in and have been listening to a random playlist for the last hour or so. I can’t tell you song for song what’s been played, but I do know that it has put a little pep in my writing step. There’s a reason you see people at the gym and marathon runners plugged into music as they push themselves to the limit. But, why? Music utilizes our body’s sympathetic nervous system to get a rise out of us. Auditory signals, like those we get from listening to music, can increase heart rate, get blood flowing, and open airways. With such responses, are body is at a state of readiness that allows us to get things done, whether it’s running a 5k or finishing an assignment. Some studies even suggest that music increases our coordination and is responsible for sending signals to our brain which helps us with perceptual and cognitive reasoning. Perhaps this increased ability to understand allows us to more clearly see an assignment for what it is. With this clarity, we’re able to more easily and readily take on and complete a task. Thankfully with streaming services, like Amazon Music Unlimited, you’ll never be without your musical motivation. What do you think? What are some of your tried and true work from home motivation tips? Share them in the comment below. 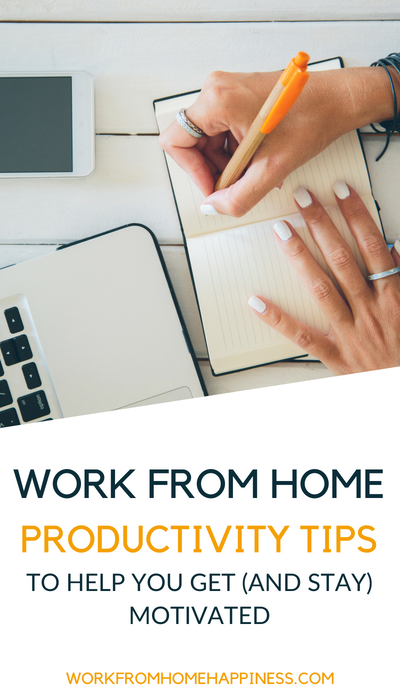 The post Work From Home Productivity Tips To Help You Get (And Stay) Motivated appeared first on Work From Home Happiness.